On Edinburgh’s Dalry Road, there is a sculpture of two draymen rolling a beer barrel. It is set slightly back from the pavement and is probably not even noticed by the shoppers and office workers who hurry past it each day. The sculpture is a tribute to Edinburgh’s brewing industry, prominent in that part of the city. The sculpture is notable because it is a rare example of this type of art in Britain. Of course, there are many statues, but street sculpture, with its underlying sense of humour, is not easily found in the UK. In Eastern Europe, though, it is much more prevalent. Perhaps the best-known location for the genre is Bratislava. 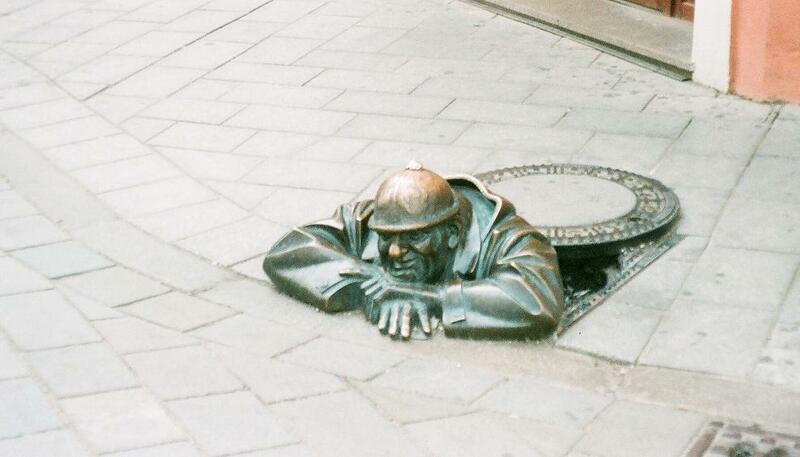 The Slovakian capital has some fine and famous examples of the art. How many tourists have stopped to take pictures of the figure appearing from a manhole or snapped their friends sitting by the Napoleonic soldier leaning on a bench? It is certain that the rather seedy-looking paparazzo, sneaking a photo outside a restaurant, has in turn been photographed on thousands of occasions. 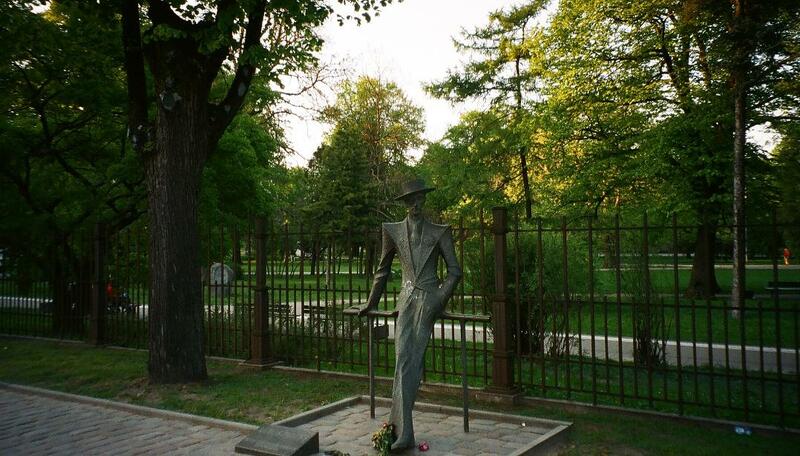 Take a stroll through Riga and you will encounter a rather Bohemian-looking character lolling against a park fence. The figure is that of Kārlis Padegs, one of Latvia’s most famous artists, who died from tuberculosis at the absurdly young age of 28. The statue stands outside the Vērmanes Garden in central Riga. 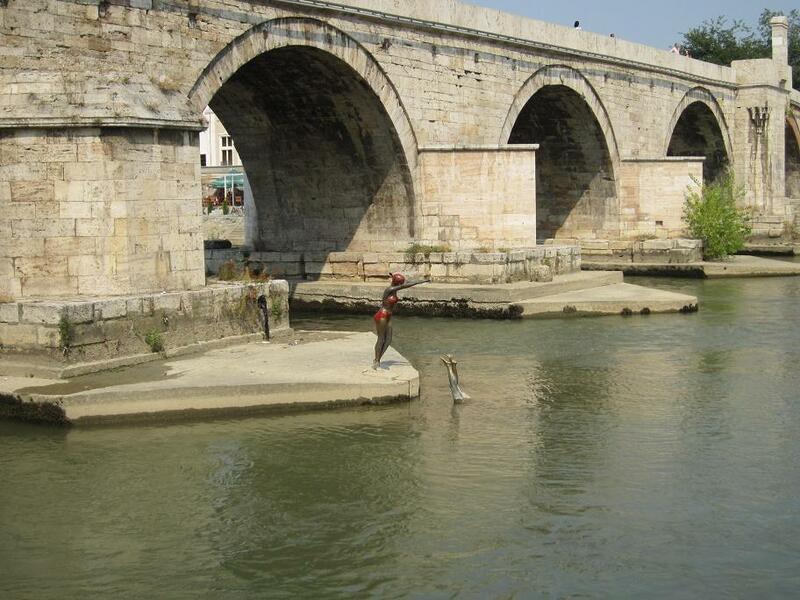 Skopje houses a riot of statues and monuments. Some of them, like the Alexander the Great statue in Macedonia Square, are magnificently over the top. Others, dotted randomly about the city, are just plain crackers. By the river, a woman is about to dive into the river. A friend has already taken the plunge, as we can see the feet of the previous diver. There are musicians, giant fish and all sorts of surreal lunacy. 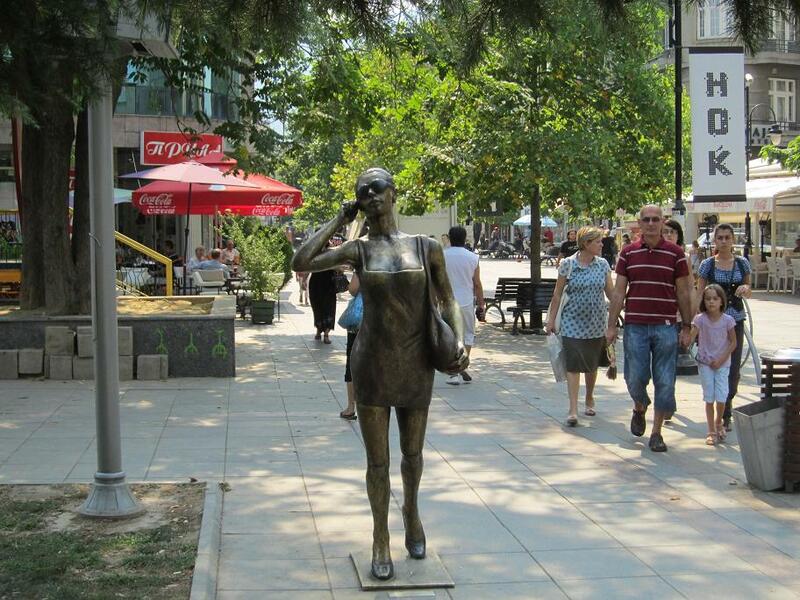 Skopje has a seemingly insatiable desire for statues of great historical figures, but in contrast to all this stands a sculpture of a trendy young woman in dark glasses, mobile phone pressed to her right ear. 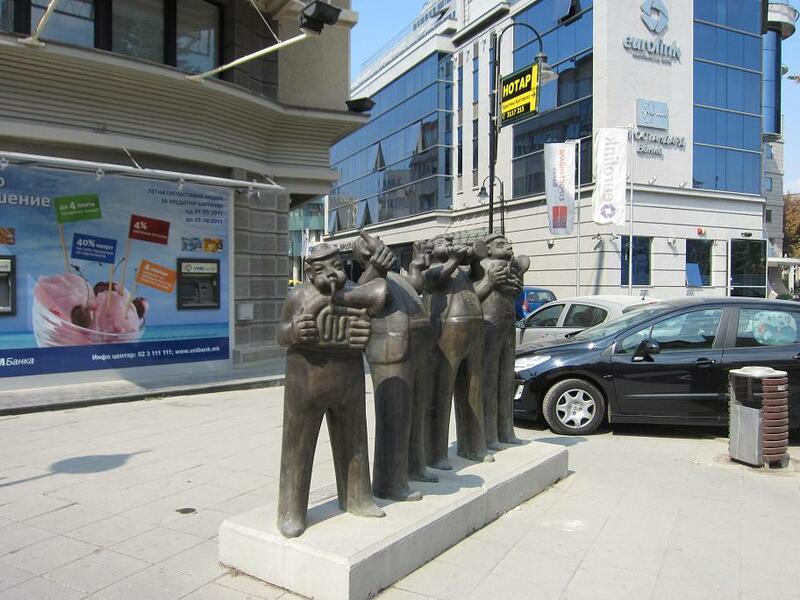 The Balkan region is a good source of strange artwork popping up in unexpected places. 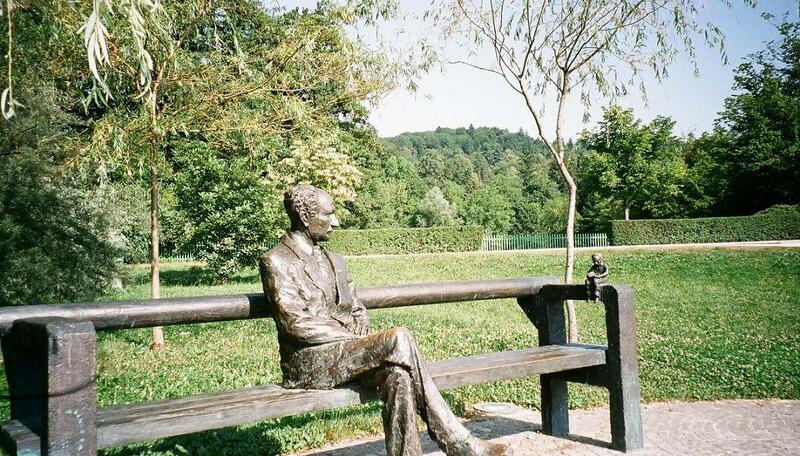 In Ljubljana, take a stroll through Tivoli Park and you’ll spot an elderly gentleman sitting on a bench. Nothing too strange so far, but glance to his left and a miniature version of the figure is perched on the arm of the seat. 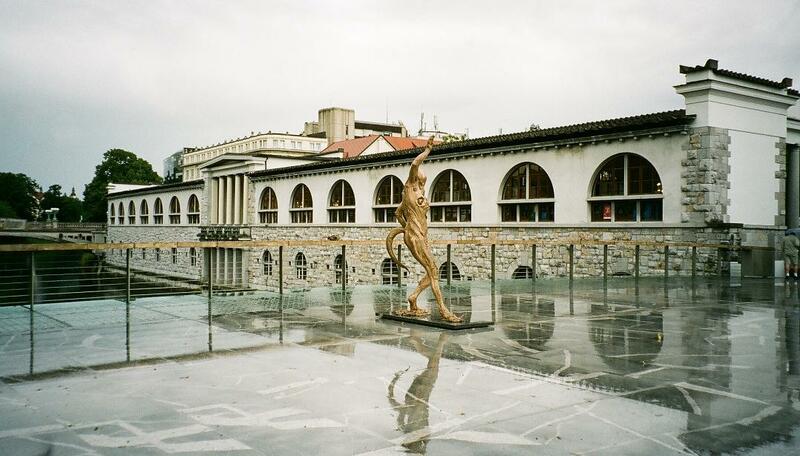 The new Butchers’ Bridge, across from the Central Market in Ljubljana, is even more zany. Adam and Eve, Prometheus and a startled Satyr vie for attention with a host of grotesque frogs, shellfish and other oddballs. The bridge has become a spot for lovers to attach padlocks, optimistically proclaiming their eternal love. 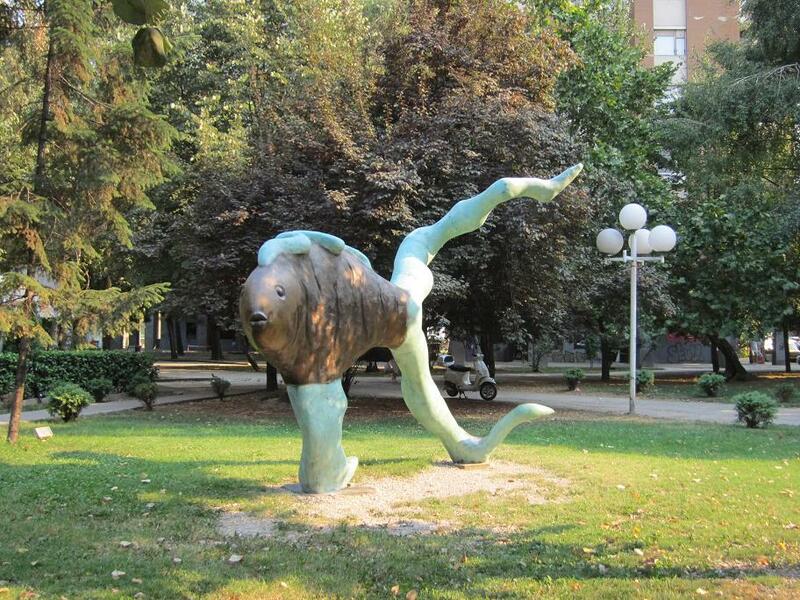 Sofia, by comparison, is relatively sober in its art. 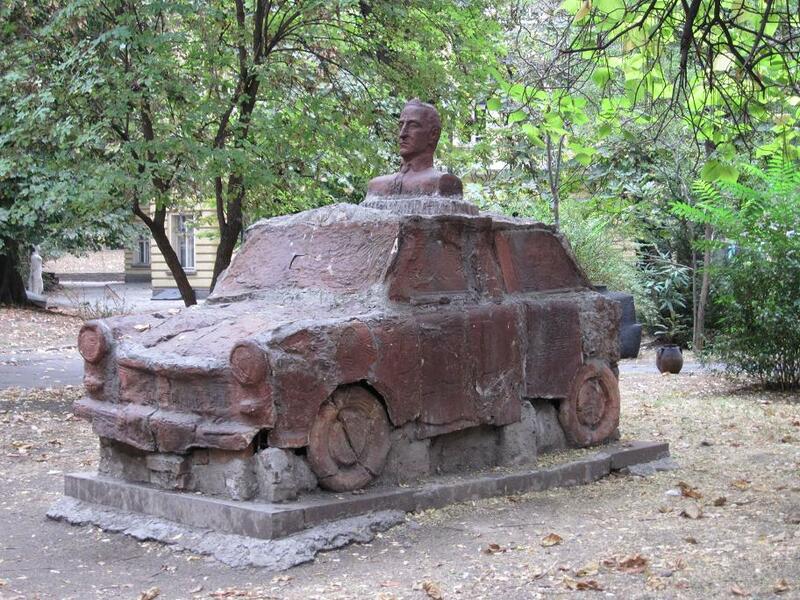 Even so, a walk through the City Garden might cause a little surprise as you encounter a muddy-looking car with a large head on its roof. Closer inspection reveals that the work is, in fact, a tribute to the Trabant, the legendary, if horribly inefficient, East German car. Finally, a couple of favourites from Budapest. 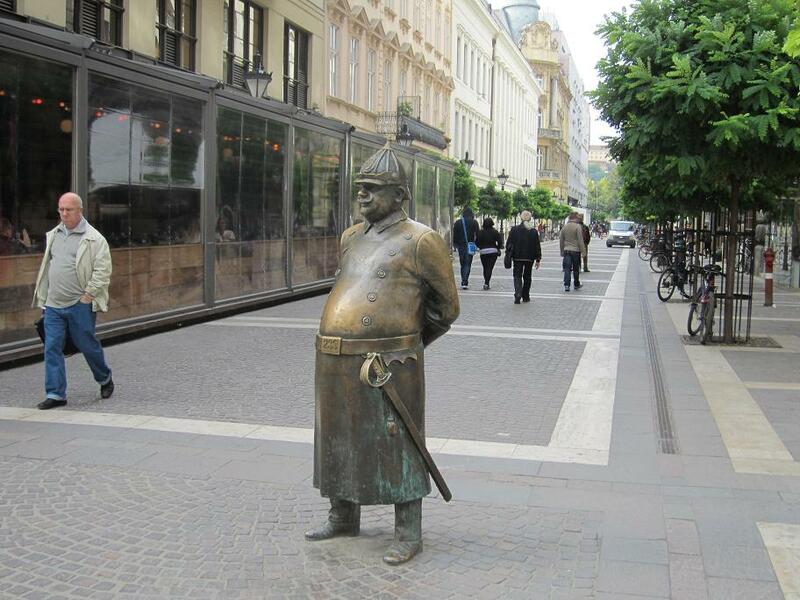 A fat and rather pompous-looking soldier stands guard amidst the shoppers in the city centre, looking slightly like a Magyar version of Dad’s Army’s Captain Mainwaring. 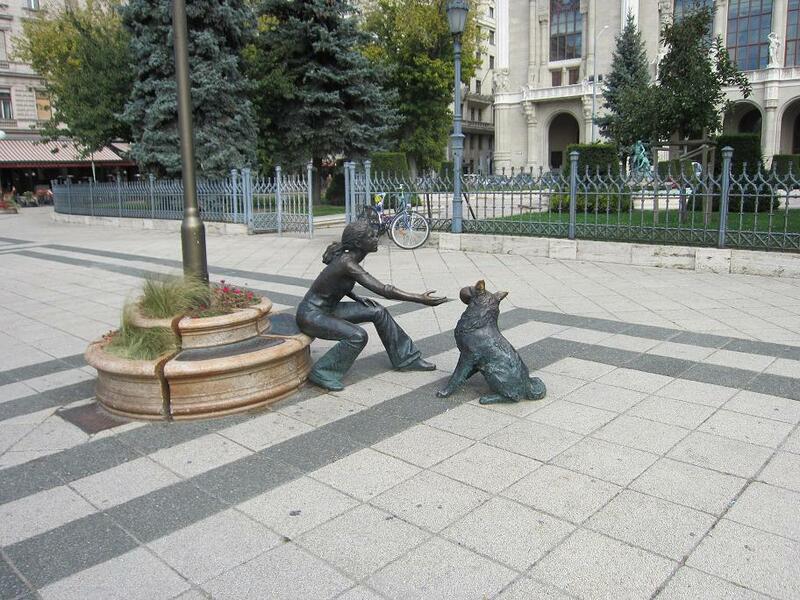 Another well-photographed figure in the city is the ‘Little Princess’, the girl reaching out to a dog to retrieve the ball in its mouth. 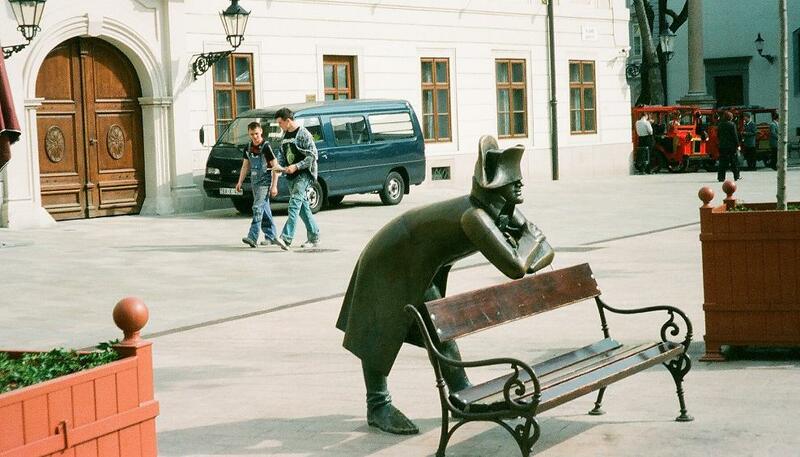 The statue is in Vigadó Square, the small garden outside one of Budapest’s famous concert halls. These works add something to their surroundings. There is, in the best of them, an undercurrent of humour. This is art that doesn’t take itself too seriously and that cannot be a bad thing. 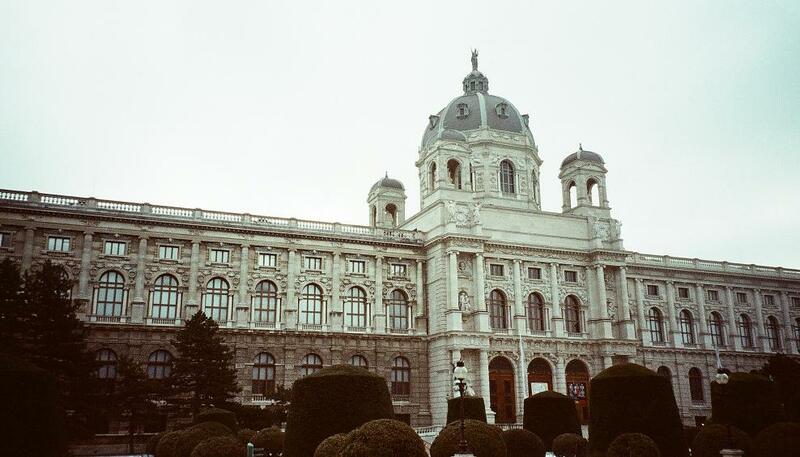 Vienna’s Kunsthistorisches is, essentially, the legacy of the avid collecting of the Habsburgs. The result is one of the finest collections in the world, with a particularly outstanding selection of Old Masters. The collection is housed in a suitably impressive building in Italian Renaissance style, which is not, perhaps, quite as old as it initially appears, having opened only in 1891. It has an identical twin immediately opposite across Maria-Theresien-Platz in the shape of the Natural History Museum. There is a huge trove of paintings, but much else besides. The numismatic collection alone has more than 700,000 coins and notes from all parts of the world, covering three millennia. Greek and Roman antiquities, another Habsburg obsession, are also abundant, but perhaps the most interesting of the non-paintings is the Egyptian collection, a truly huge mass of treasures. 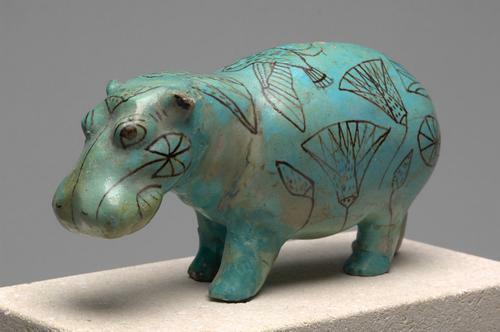 The most charming piece is surely the rather lugubrious blue hippo, whose flanks are decorated with scenes of its surroundings and reminding us that Egypt was once a much more fertile land than it is now. The paintings are ordered by place and date largely form the 16th and 17th centuries. The Venetian Renaissance features prominently, with Titian, Veronese, Canaletto and Tintoretto to the fore. 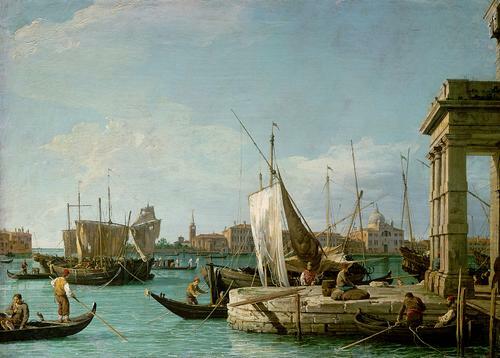 Venetian artists tended to be valued a great deal more outside their homeland; it’s quite difficult, for example, to even find a Canaletto painting in Venice. The Flemish collection’s highlight is Rubens’ The Fur, an intimate portrait of his wife. The picture is in classical style, the artist’s wife posing as Venus. The gallery also features a generous helping of works by van Dyck. Not surprisingly, there is a considerable German collection, with many works by Dürer and a fine selection of portraits by Holbein. 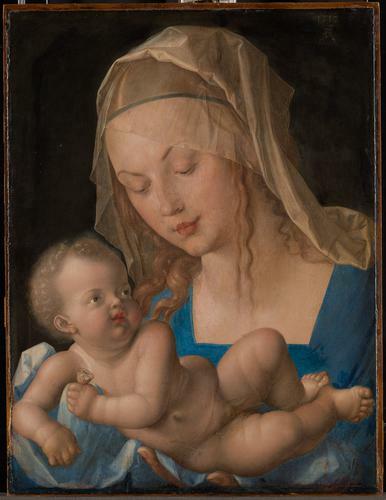 Dürer painted many Madonnas and one of the most famous resides in Vienna, a depiction of Mary with a child holding a pear. 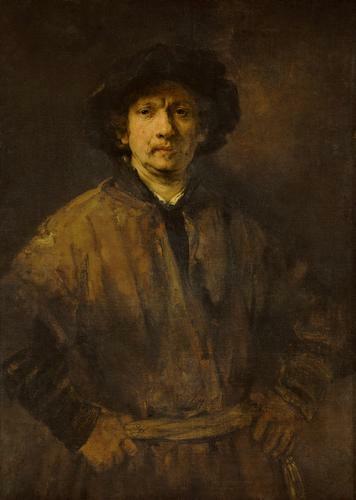 A Rembrandt self-portrait stands out among the Dutch collection. It is one of his later works and depicts the artist looking just a little down-at-heel, but defiantly staring front-on to the world. 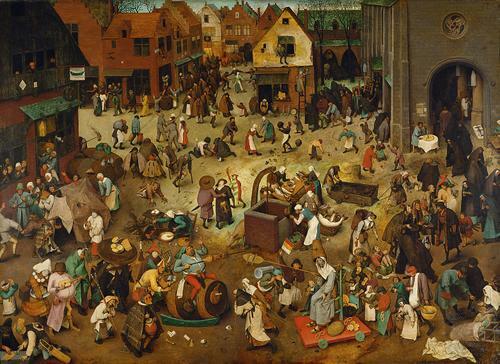 A personal favourite among the Dutch works is The Fight Between Carnival and Lent, painted by Pieter Bruegel in 1559. It is a wonderfully eventful painting – there is just so much happening. By a happy and strange coincidence, a detail from the painting graces the Penguin edition of the cover of another personal favourite, the Rabelais masterpiece, Gargantua and Pantagruel. There is a substantial collection of Bruegel’s works – the largest in the world – at the museum. The Kunsthistorisches has a catalogue that reads like a history of art: Rubens, Rembrandt, Dürer, Titian, Tintoretto, Canaletto, Vermeer, Raphael, Velazquez and a host of others. Set aside a few hours; you can punctuate the visit with a break (or two) for a leisurely cup of coffee and perhaps even a little slice of cake at the museum’s decorative and appealing café. Coffee, like art, should never be rushed. It was five degrees below zero and there was snow lying around. No matter; trains, trams and buses were running perfectly normally. These little things matter. In the UK, it sometimes seems that the merest drop in temperature or a little snow causes the entire transport network to cave in completely, though obviously cold or wet weather is so unusual in Britain that the chaos is entirely understandable. In mainland Europe, though, life continues. If you’re on a three-night trip and planning to use public transport and visit museums, it’s worth buying either a Vienna card (for about €20) or a 72-hour public transport pass for €14.50. You don’t get a big discount for museums (most are 10%), but there isn’t much of a difference. If you’re visiting in freezing temperatures, there is more of a temptation to dash down into the warmth of the U-Bahn for a short while. There is no shortage when it comes to museums. The Neue Burg at the Hofburg Palace has three museums, the Ephesus Museum, the Museum of Musical Instruments and the Kunsthistorisches (or Museum of Fine Arts, if you don’t want to spend half an hour unravelling your tongue). The Musical Instruments Museum contains some delightful oddities, several of which appear to have been designed for an octopus with three mouths. A personal choice would be to visit the museums in the order listed above. The Kunsthistorisches is likely to take quite a while, as the collection is vast. It is simply too big to do justice to in this brief article and will be considered as part of a little series on museums and galleries. Museums of Natural History are not generally, I concede, my favourites. All too often, there is a rather moth-eaten collection of stuffed animals and that is as far as it goes. The Vienna version, however, has a lot going for it. Yes, the taxidermists have been kept in employment, but there is a wealth of fossils and minerals here, enough to keep an army of David Attenboroughs happy for several days. The city has more than a hundred museums and some of them are decidedly different. Those with a sense of the morbid might enjoy a trip to the Undertakers’ Museum, perhaps after seeing how victims may have been despatched by a look round the Kriminalmuseum. 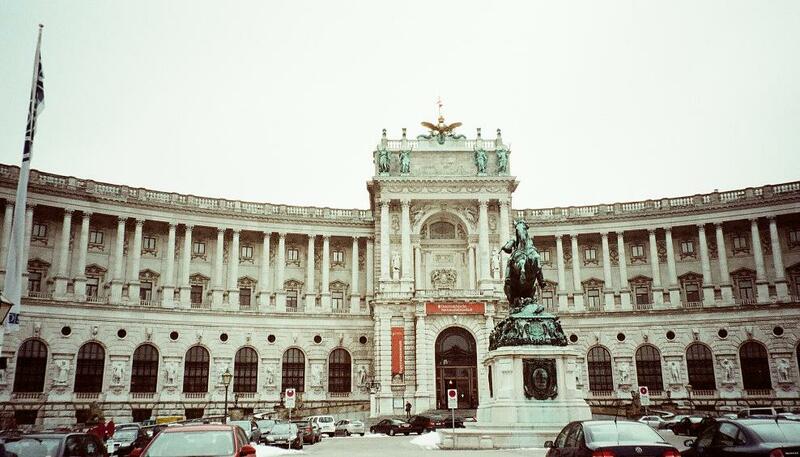 There are also museums dedicated to those favourite Viennese drinks, schnapps and coffee. Music, of course, is another Viennese speciality. The Wiener Staatsoper (Vienna State Opera) is both an opera house (in Neo-Renaissance style)and opera company and is possibly the busiest in the world. There is something happening throughout the year and it’s perfectly easy to turn up on the night and buy a cheap ticket if you don’t mind standing. Going to an opera or a classical performance is not the preserve of the elite in Vienna. 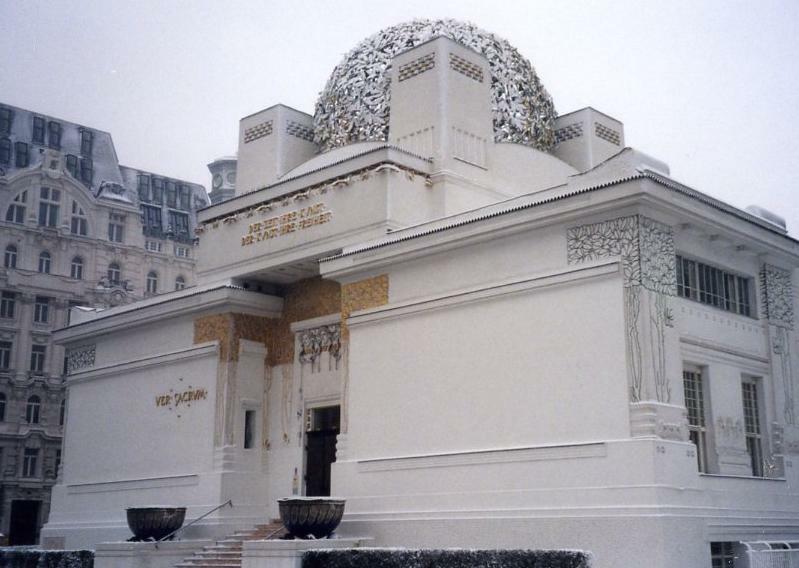 Not too far from the opera house is the Secession Building, an extraordinary Art Nouveau concoction that acts as an exhibition hall. The features the Beethoven Frieze, a work by Gustav Klimt that was originally intended only as a one-off for an exhibition, but has stuck around for more than a hundred years. Adding to the general lunacy, there is a statue of Mark Antony being hauled around in a chariot by a team of lions. Visiting a coffee house feels obligatory. How could one go to Vienna and not visit a coffee house? Naturally, they get rather busy when it’s cold, but there are plenty of them and you should be able to squeeze in somewhere. If all else fails, then you can book a table for another time. Only in Vienna could you imagine booking a table for a cup of coffee. There are quite a few cafés near the park. A couple of good ones are Café Diglas and Café Pruckel, but there is not exactly a dearth. The ideal is a sense that you have been transported back in time and if you can immerse yourself in a deep philosophical debate while enjoying your coffee, even better. 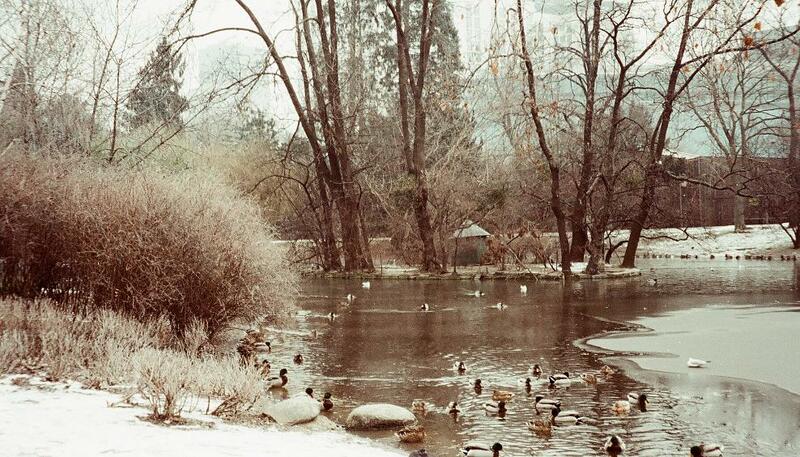 The ‘park’, of course, means the Stadtpark, the huge municipal park in the city centre. 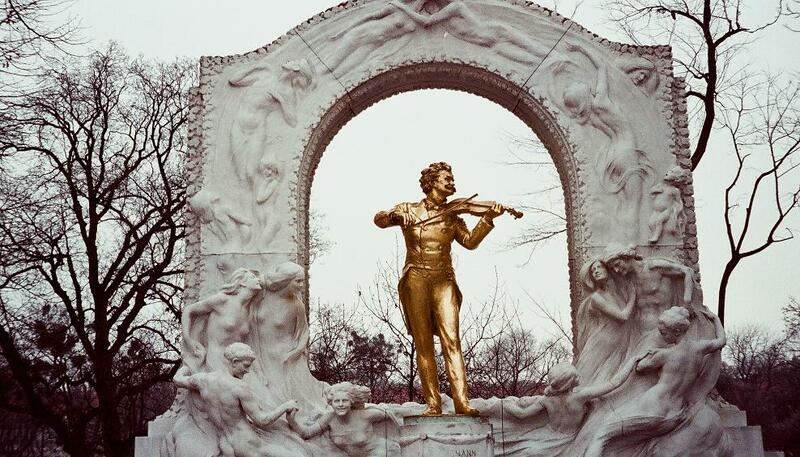 It’s filled with monuments and sculptures, including the famous gilded bronze affair that portrays Johann Strauss. Franz Schubert is also well-represented, with a fine monument. The music of Strauss and Schubert can still be heard in the park, at the Kursalon, a beautiful pavilion in Italian renaissance style. Vienna has a particularly impressive public transport system. The U-Bahn has six lines and the trains are amazingly frequent. To miss a train by seconds early on a Sunday morning may sound like a serious annoyance, but the indicator boards reassure you that you’ll only have to wait a few minutes for the next one. Also impressive is the CAT (City Airport Train), especially for those of us used to the legalised extortion racket that is the Heathrow Excess Express. The CAT is not exactly dirt cheap, but ten euros for a single (using a Vienna card) isn’t too bad. The trip takes fifteen minutes or so and you get a nice big double-decker train to sit on. Vienna is no different to any other capital city in that there are expensive places to eat and drink, and there are not-so-expensive places. Food leans towards the meaty, but just about everywhere has a vegetarian option and one particularly pleasant evening was spent in the Palatschinkenpfandl, a pancake house where spinach and sheep’s cheese pancakes were washed down with several glasses of Salzburg’s Stiegl beer. There are many, many worse ways of spending about 20 euros. One pleasing thing about Vienna (not that it’s too hard to find pleasing things) is that there are some delightfully old-fashioned bars. Bane’s Bar represents a throwback to days when pubs were for drinking beer in, rather than posing ostentatiously and pretending that you really want to eat roasted polenta with crispy ostrich droppings in a rich salmon and chocolate sauce. Bane’s offers beer, atmosphere and the feel of a good local, all served with a pleasing background of jazz and blues music. Austria, naturally, is rather overshadowed by its German neighbour when it comes to beer, but has a good range of both breweries and beer. Another brewery from the west of the country, Hofbräu Kaltenhausen, dates to the 15th century and is notable for its wheat beer (under the Edelweiss name). It also produces some intriguing dark beers, including a black lager and a creamy chocolate stout. 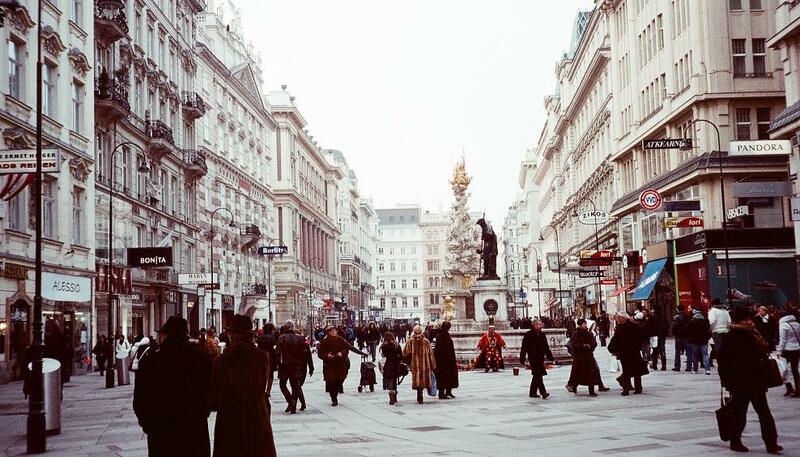 There really isn’t a bad time to visit Vienna. There is always something pleasing about sitting outside a café or bar on a warm summer’s day, but a trip in the cold of winter is just fine. A little walking around can be interspersed with strategic disappearances into cafés, museums, restaurants, bars and any of the myriad delights on offer. Besides, a little chill in the air does no harm if you really want to revisit the eighties and do that coat-collar-up thing from the Ultravox video. The Fatih Mosque was built soon after the capture of Constantinople and named after the conquering sultan, Mehmed II (faith meaning ‘conqueror’ in Turkish). Building was completed in 1470, 17 years after the fall of the Byzantine capital. It was built on the site of the Church of the Holy Apostles, Constantinople’s second largest and second most significant church after Hagia Sophia. A church had been built on the site by Constantine the Great and a second – and naturally, larger – version built on the same site by Justinian. Mehmed allowed the Greek Orthodox Church to retain the church as its administrative centre, but the agreement was unlikely to last and the church, now in an advanced state of disrepair, was demolished in 1461-2 to make way for the new mosque. The architect was Atik Sinan, who is not to be confused with Mimar Sinan, a later and even greater architect who was responsible for many of Istanbul’s mosques, including the Süleymaniye. The present building differs somewhat from the original. Like many buildings in Istanbul, the Fatih Mosque suffered damage from a number of earthquakes and the current building owes its style to a 1771 rebuilding. Like so many of Istanbul’s mosques, the design of the Fatih Mosque is redolent of Hagia Sophia, with a large central dome with outlying smaller domes. The building also displays that decidedly Istanbul Ottoman-Baroque style. While the exterior may be different to the original, the interior closely resembles the initial décor designed by Atik Sinan. 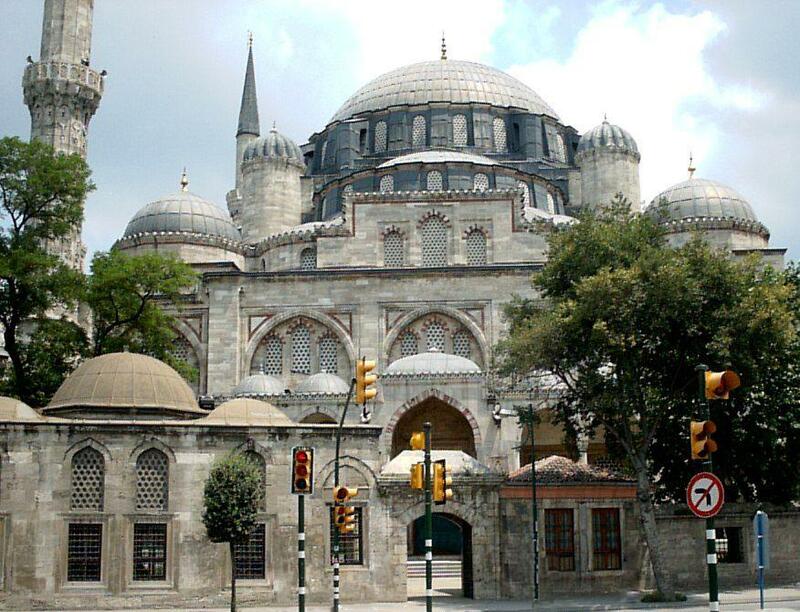 All of Istanbul’s imperial mosques were built as complexes, designed not simply as places of worship. 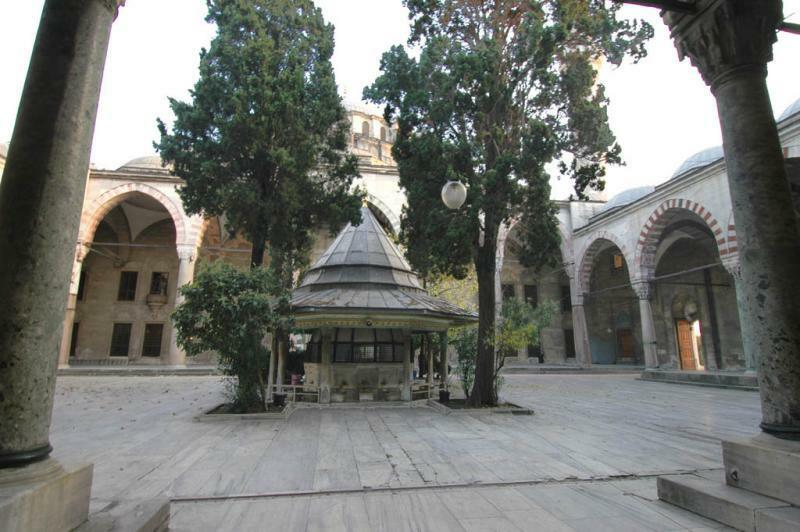 The Fatih is no exception and the Hospice has a particularly fine courtyard with an array of columns that are believed to have been part of the Church of the Holy Apostles. The site also contains the tomb (türbe in Turkish) of Sultan Mehmet II. This is a particularly baroque affair with intricately ornate decoration. It is, perhaps fittingly, the most lavish tomb of all the Ottoman sultans.